The Italian musician Fabio Barzagli was effusive: "Friendships, joining, travelling around different countries, discovering new samples, effects, styles, having that magic art-trip while watching the big screen with a thousand other people. That's the demoscene!" Demos are short samplers of creativity put together by teams of programmers, artists, musicians and designers, but with a twist: they're executables. Everything you see (and sometimes everything you hear) is generated in real-time. Demos began as add-ons to cracked games, designed to show off the prowess of the person who removed the title's copy protection. In the 30 years since the first examples appeared, the 'demoscene' has become established in its own right. There are now international demo conferences (called 'parties') that attract thousands, and many host hotly contested competitions. For the sake of the competitions, demos are split into categories. Short demos are called intros. Some categories have incredibly tight memory restrictions: in an age when Windows itself now needs 2GB of RAM, some of the most restrictive competitions limit the executable to just 4kB. The larger 64kB demo class really begins to exploit the power of a modern PC, and the mega demo class (any demo over 1MB, or a floppy disk of code) might also include large graphics and sound libraries. Older computers continue to be popular with demo makers keen to squeeze the last clock cycle from their CPUs. 'Sceners', sometimes working with original kit, still write for the Commodore 64, Atari ST and even the Sinclair Spectrum. As the demoscene has evolved, so the categories used to judge them have also developed. Today's competitions are as likely to include genre-blurring categories such as Most Original Concept and Best Technical Achievement as they are Best Commodore Amiga Demo. It's not necessary to have access to old-school hardware to view any of the demos in this feature. Where necessary, videos of each can be viewed at www.demoscene.tv. So why do static, non-interactive demos matter, at a time when PCs can generate detailed, interactive worlds for us to play in? Read on to find out, and for a look at some of the coolest and most influential demos out there. 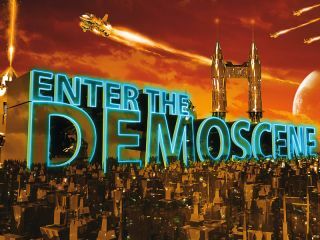 It's time to enter the demoscene and get a flavour of its variety and ingenuity. Though it was created for fun over a couple of days, with over a million particles in motion at any one time, Blunderbuss is anything but a blunt weapon. The demo features what looks like a burning match head, with wisps of smoke curling away from it under the influence of a slight breeze. An acoustic guitar and vocal plays in the background. As the demo unfolds, the smoke sometimes moves as if responding to a gust of wind, and takes on the shape of a word from the song. Blunderbuss is a very impressive piece of work, and it took second place at the MAiN 2009 demo competition in France last year. Show people Elevated and most will be mildly impressed. Show them the size of the executable, however, and they'll immediately want to see it again. Elevated is just 4kB long and yet contains a near photo-realistic fly-through of a mountainous landscape. It's all generated entirely in real-time – including camera motion blur. The trick to packing so much into so little space is a powerful graphics card. Much of the processing, including calculating the path along which the camera can fly, is done by the powerful GPU required to run the demo. It's still a very impressive piece of work, however. Craft is a demo that runs on the absolute minimum of hardware. It took first place in the Wild Demo category at the Breakpoint 2008 competition in Germany, and runs on an Atmel TAMega88 microcontroller chip containing 8kB of flash RAM to hold the program and a further 1kB of volatile RAM for variables. The chip itself generates multichannel sound and VGA video. The demo video begins with a sequence explaining the hardware, which can be constructed for under £10. Despite its low cost, the demo itself is certainly as good as some of the classic demos written for the Commodore 64. No roundup of the current demoscene is complete without the innovative Farbrausch group. Weighing in at 809kB for the main executable (and 5MB for its packed data file), The Cube is a fine example of making the simplest techniques produce the most complex graphical output. The shapes that form the initial geometric shapes gradually evolve, warp and convolute, and take on forms that can only be described as organic. Despite its simplicity, the demo requires a fast graphics card. As Farbrausch say in the notes accompanying the demo: "This is real-time, not amateur hour." Sult's release ZIP file contains just the demo's executables, and they're all just 4kB long. It has been tested on the GeForce 8600 and Radeon 4850 graphics cards, and only uses the libraries freely shipped with Windows. The music is generated programmatically, and it can take up to a minute for this process to complete, so if you're waiting around don't think that the program has crashed. The result is mostly a display of fast-moving scenes featuring rings linked together to form meshes of chain mail over an underlying landscape, but there's also what seems to be a tongue exploring the inside of an octopus' tentacle.